Many medicines that come in the form of capsules must be swallowed to be effective. But did you know that some capsules are not meant to be swallowed? Some medicines that are used to treat lung disease must be inhaled to be effective. Such medicines may come in capsules that must be inserted into a special device in order to release the drug for inhalation. One example of this type of medicine is Spiriva (tiotropium bromide), a medicine for treating chronic obstructive pulmonary disease (COPD). 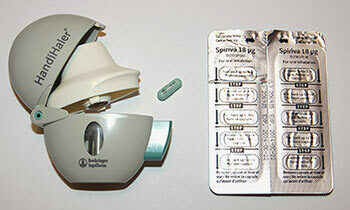 Spiriva capsules must be used with a special inhaler device called a HandiHaler (Figure 1). Figure 1 Spiriva capsules and HandiHaler device. To take a dose of Spiriva, the capsule must be removed from its blister pack and placed into the HandiHaler. The button on the side of the HandiHaler is pressed to puncture the capsule. The medicine inside the capsule can then be inhaled by breathing slowly through the mouthpiece of the HandiHaler. SafeMedicationUse.ca has received a report about a consumer who mistakenly swallowed a Spiriva capsule instead of inhaling the medicine through the HandiHaler device. The consumer had used Spiriva capsules properly for some time, but became confused after returning home from a stay in hospital. The person who reported the incident noted that capsules are a form of medicine that people are used to swallowing, and suggested that this might have contributed to the mistake. Fortunately, Spiriva capsules are not harmful if swallowed, but the medicine does not work if taken this way. If you swallow a capsule that is intended to be inhaled, your symptoms may not improve or they may get worse. Foradil (formoterol fumarate) capsules and TOBI (tobramycin) Podhaler capsules are other examples of capsules containing medicine that is meant to be inhaled, not swallowed. SafeMedicationUse.ca has the following advice for preventing mistakes like this. If you are taking a medicine, or helping someone else to take medicine, don't assume that all capsules are meant to be swallowed. Always read the label carefully, and take note of any additional reminder labels on the package. Do not place capsules that are intended to be inhaled into a dosette or pill organizer. Keep the capsules in their original packaging, with the inhaler. You can ask your pharmacist to put a reminder label on the package (e.g., "Not to be taken by mouth") to help you remember. Whenever you receive a new prescription, ask the pharmacist to review the instructions with you and explain how the medicine is to be used. If an inhaler or any other device is needed, ask the pharmacist to help you practise using it. That way, you will know how to take your medicine when you get home. Always carefully read all information that comes with your medicine. If you have questions, ask your pharmacist or another healthcare professional for help. If you or someone in your family accidently swallows one of these medicines instead of using it in an inhalation device, contact your pharmacist or another healthcare professional for advice. The consumer who made the mistake described in this newsletter was not the first person to swallow a capsule that was meant to be inhaled. ISMP Canada has received many reports describing cases like this one. Some of these mistakes occurred in hospitals and long-term care facilities, and others occurred at home. Healthcare professionals were warned about the potential for this type of mistake in a 2009 ISMP Canada Safety Bulletin. Mistakes like this have also been reported in the United States. The US Food and Drug Administration (FDA) has issued an advisory and a video warning about the potential for this type of mistake, and ISMP in the United States has provided information for consumers on their consumer website, ConsumerMedSafety.org. Read the ConsumerMedSafety.org article "Not all capsules are meant to be swallowed"